Fynshav passenger and car ferry ticket prices, timetables, ticket reservations and information for ferries sailing from Fynshav to Bojden. Compare all available Fynshav ferry ticket prices in real time and book the cheapest available Fynshav car and passenger ferry tickets sailing to and from Fynshav, Bojden with Alstrafikken Ferry Line ferries online with instant confirmation. Book Fynshav Ferry Tickets with Alstrafikken Ferry Line for ferries sailing from Fynshav to Bojden online in advance to enjoy the cheapest available ferry ticket price. The price you see is the price you pay. There are no hidden extras or surprises such as added fuel surcharges or booking fees and we do not charge you anything extra for paying with a Visa Electron card. The price we quote you for your selected Fynshav passenger or car ferry ticket, onboard accommodation and vehicle type is all you will pay, and that's a promise. To obtain a Fynshav ferry ticket price and book your ferry ticket securely online please use the real time ferry booking form on the left. You are also able to add a hotel at your destination, or anywhere else, to your ferry ticket when completing your ferry ticket reservation. Fynshav is located on the Danish island, Als, in the southeast of Jutland. The ferry route from Bøjden on the west coast of Funen to Fynshav on the island of Als, makes it possible to take a shortcut from Funen to South Jutland and Germany – without having to drive across The Little Belt Bridge. When choosing the Bøjden-Fynshav ferry, you can save about an hour, compared to taking motorway E45 across Funen and motorway E20 through South Jutland. The costs are more or less the same – the cost for fuel used for driving compared to the ferry ticket. Another benefit by using the Bøjden-Fynshav ferry is the possibility to relax for 50 minutes – the crossing time by ferry across southern part of The Little Belt. The Bøjden-Fynshav ferry is operated by the ferry company Færgen, which uses the ferry Thor Sydfyen on the route. The ferry departs Bøjden or Fynshav every second hour – on the hour. 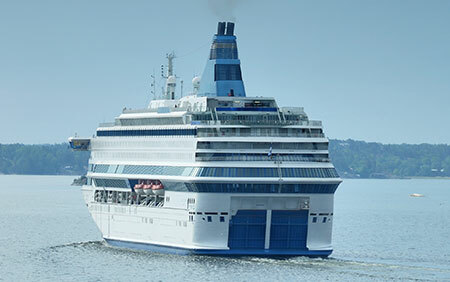 However, in the daytime during the summer, two ferries operate the Bøjden-Fynshav route with hourly departures. The Bøjden-Fynshav route was operated by Scandlines a few years ago, and the photo above is from the Scandlines days. The Bøjden-Fynshav connection is part of Highway 8 from Nyborg on Funen to Tønder in the south western corner of Jutland. Highway 8 is mostly a two lane highway, but a very scenic one. Especially the part across the south of Funen contains plenty of scenic beauty crossing though woods and passing close by several big manor houses and the very popular and famous Egeskov Castle. Expect about one hour of driving time when driving from Nyborg to Bøjden on Highway 8. Fynshav is filled with nature, and is a paradise for nature lovers, and the land here is dominated by hills and forests. The climate on the island is mild and this caused the growth of exotic plants, not found anywhere else in Denmark. A 165 km long coast is surrounding the island, and therefore a beach is always to be found. On Als you can bath or surf and those up for some fishing will find joy in the pleasant ports and peaceful bays. Surrounding the island is several shipwrecks, which can be dived to. If you don’t wish to dive yourself, you can watch the divers on a TV as they go down to the shipwrecks. Høruphav is located 16 km from Fynshav and is a little pleasant fishing town, and here you can enjoy the different impressions or take a wander out to the nature area of Trillen, from where a sight tower can be used to watch the birdlife in the area. The Danish Glass Art in Høruphav is worth a visit. Experience the shop and the workshop, were only sand, soda, calk and approved colouring is used. Danish Glass Art is the only glassblowing in North Europe, who work in stone in solid, handmade glass. In the city of Sønderborg, 16 km from Fynshav, you will find a beautiful seafront, historical buildings, good shopping opportunities, and a castle, from where you can admire collections from the ancient time up till the present. In Danfoss Museum you can experience a industrial adventure from the present and the future. Best Price Guarantee - We always offer you our lowest available passenger and car ferries ticket price to and from Fynshav. There are no hidden extras or surprises such as added fuel surcharges or booking fees and we also we do not charge you anything extra for paying with a Visa Electron card. The price we quote for your selected Fynshav ferry ticket, onboard accommodation and vehicle type is all you will pay, and that's a promise! In the unlikely event you find the same all inclusive Fynshav ferry ticket cheaper in the brochure of any other tour operator we promise that we will do our best to beat that price or offer you the choice of requesting a refund. To book Fynshav car and passenger ferry tickets please click here. At ferryto.co.uk you are able to obtain live Fynshav ferry ticket prices, check availability and book car and passenger ferry tickets to and from Fynshav at our lowest available ticket price. Ferryto.co.uk is part of the world's largest online ferry ticket distribution network providing the ability to book over 80 major European ferry operators including to Fynshav and to over 1,200 other ferry routes throughout the UK, France, Spain, Ireland, Holland, Eastern Europe, the Mediterranean, the Baltic and North Africa.